We know how precious your belongings are. That is why our portable storage unit is all-steel and weatherproof – ensuring your stuff is as safe and secure as possible. Here are some helpful tips that can make your portable storage job go smoother. 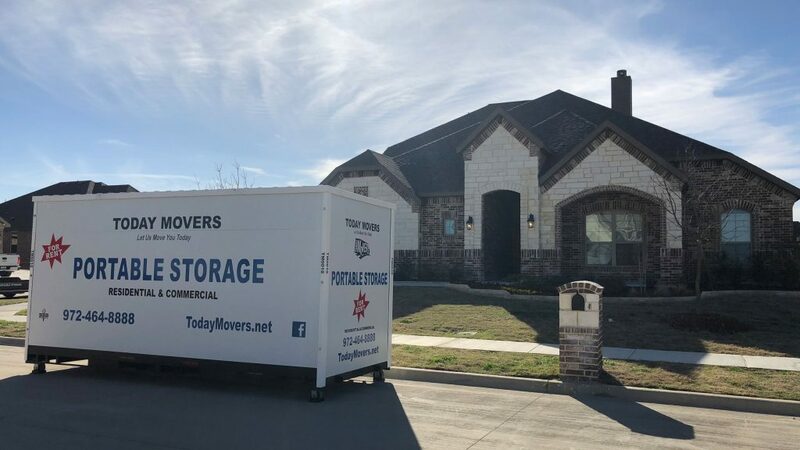 Call Today Movers at 972-464-8888 for a free estimate! A written inventory will save time in the long run. Valuable items need to be kept close to you. This will reduce the risk of damage. Write a legible label on each box to define where it goes. Heavy items go in smaller boxes. Lightweight items go in larger boxes. Use as many boxes as needed. Boxes are easy to stack and provide greater space efficiency. Use specially sized boxes and bubble wrap when packing pictures, mirrors and artwork. Flat screen TV boxes are also available for your large screen TVs. Lamps and other large items should be bubble wrapped. Remove light bulbs and box lamp shades separately. Fill each box to its capacity, using packing paper or fillers to eliminate empty spaces. Don’t overpack! Moving blankets will protect your furniture. Use moisture absorbers to help prevent mold, mildew, and odors inside the container. Wrap couches, mattresses and other “soft” furniture with stretch wrap or plastic mattress bags. Cover appliances with cardboard, moving blankets or stretch wrap. Distribute the weight of your contents throughout the container. Place heavy items on the bottom, lighter items on the top. Mix small items with larger items to fill spaces. Secure your container with a lock when it is unattended.